July 7 1909 -- An anonymous article writer (Herriman?) claims that a "No-Hat Club" is forming in Los Angeles. The group of well-known LA movers and shakers, mostly bald, are cited to be looking to grow a new crop of hair by letting the sun get at their domes. Supposedly hatters are up in arms over this business-draining development. 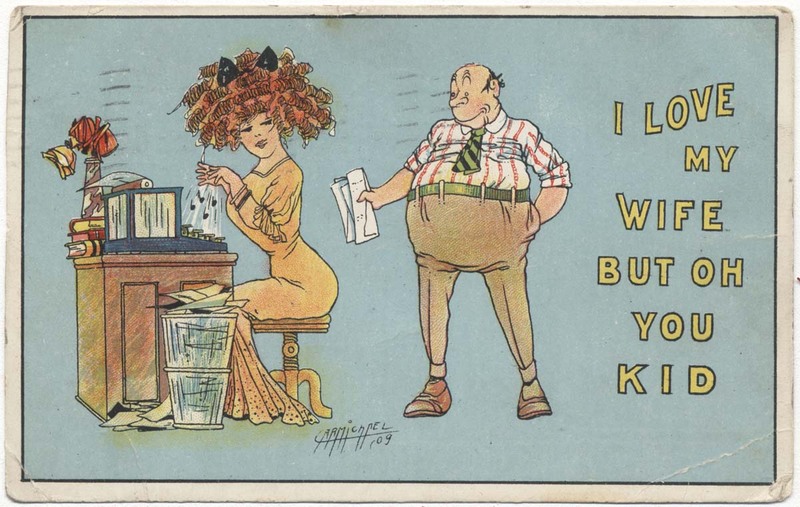 Here's another "I Love My Wife But Oh You Kid" card by Carmichael, presumably issued as part of Taylor & Pratt's Series 565, though they forgot to take any credit on this card. I think Carmichael did a nice job on the art, though I wonder at the construction of that typewriter. Don't think I've ever seen one that has a big glass (?) box on the rear section. These are sort of racy cards, implying as they do marital infidelity, so I particular enjoy this card for the message that was penned on the back of it: "See you in church next Sunday!". Typewriters of that era did have glass panels. I used to have one, and you might see them in office scenes. Why this was I'm not sure, but it may have been to show when the works needed cleaning. If they weren't, the oily meachinery would soon be covered in greasy dust. Charamichael's usual low bar standards are reached here. It might be he never saw a typewriter, and only had one described over the phone to him. Since there are no motion lines indicating that the proto- Cam O'Flage is using the typer as one might expect, one can only guess she's somehow radiating a musical light beam at it with her hands. Erwin Louis Hess was born on August 17, 1906, in Milwaukee, Wisconsin according to the Wisconsin, Births and Christenings Index at Ancestry.com. His parents were Alfred Hess and Amaude G. Sproette. In the 1910 U.S. Federal Census, the family of three lived in Milwaukee at 1614 Cherry Street. Hess’s father was a bookbinder. Their address was the same in the 1920 census. According to the 1930 census, Hess was a commercial artist who lived with his parents and brother in Milwaukee at 498 76th Street. The St. Johnsville Enterprise and News (New York), March 8, 1951, published Hess’s recollections of his life and art and how it influenced his strip Good Old Days. “When I was a little boy,” he writes, “I liked to take note of how people lived. While other kids were playing mibs, I found greater pastime pleasure in watching Grandma grind coffee with the grinder in her lap or peeking into the neighbor lady’s basement window as she labored at her hand-powered washing machine. And so it continued throughout my boyhood days. It fascinated me…the plain sight of seeing how folks actually lived and the backgrounds which made their lives interesting...to me. All this is captured and preserved in my youthful mind. “When I was six i began to like to ‘draw’ pictures. I admired the nice drawings my Aunt Bertha drew. She could, right well, draw ‘almost as good as Nell Brinkley.’ And so I, too, drew and drew pictures…using up loads of paper from fat, nickel pencil tablets. “Since those days I have listened to many other grandmothers discussing their problems and joys of the past, and my second and third homes were the historical museums and libraries which contained actual bits of yesteryear and old newspaper files. There I made countless sketches of old buggies, oil lamps, baseburners and dress styles to make my cartoons authentic in every detail…while my ideas come from that ‘memory notebook.’ Kitchen scenes used in my cartoons, on several occasions, are the actual kitchens my two grandmothers lived in…down to the almanac hanging from the shelf over the sink. “In grammar school,” Hess continues, “I was referred to as the ‘best drawer in the class.’ But when it came to arithmetic…well, my face still turns to a brilliant shade of red. At the age of thirteen, my first cartoon appeared in a Milwaukee newspaper…a political cartoon…for Milwaukee was always known as a hotbed for turbulent politics. The whole eighth grade was buzzing at having a ‘political cartoonist’ in their midst. “Then I attended high school and continued my ‘artistic career’ to become the art editor of the ‘Comet,’ West Division High School’s monthly magazine. Why mention just ‘another high school'? well, to me ol’ Wes’ Side has always remained tops…for General Douglas MacArthur went there years ago. Yessir! And so did actor Spencer Tracy and many others, including my contemporary student-friends, the late Carl Zeidler, who became mayor of Milwaukee. “When I left ol’ Wes’ Side, a Chicago artist took an interest in me, and his private tutoring was my ‘art school education. I didn’t get a diploma from the fellow, for he was from the old school, but he would have made a good instructor in any academy. Sensing what I was best fitted for, he advised me to further my preparation far true life cartoons my making am intense study of furniture. “And intense it became, but the experience I gained proved the fellow was right. I took a job as an artist in a furniture store and the ‘monotonous grind’ turned out to be highly valuable for me later in the drawing of room settings…accurate in all their details. “Fate later put me, like all of us who go ‘through the mill’ on a newspaper doing everything from war maps and sports cartoons to political cartoons and editorial sketches, etc., etc. However, inwardly my feeling for true-to-life cartoons always remained and overshadowed the routine stuff I was doing …but I did not object. It bought bread and butter for my wife, Yvonne, and me. Moore’s Who Is Who in Wisconsin (1960) said Hess did furniture advertising from 1926 to 1936. He was a staff artist on the Milwaukee Journal from 1936 to 1938. He married Yvonne Va Kovic on June 27, 1936 in Milwaukee. Hess was a freelance book illustrator for Western Printing & Lithographing Company from 1939 to 1946. The 1940 census recorded self-employed commercial artist Hess, his wife and son Dale in Milwaukee at North 3336 37th Street. American Newspaper Comics (2012) said Hess’s first comic series was Do You Remember?, in 1938 for the Milwaukee Journal. Hess drew Captain Midnight for the Chicago Sun Syndicate from June 29, 1942 to April 15, 1945. Hess’s Good Old Days was a long-running United Feature Syndicate series, from June 9, 1946 to March 29, 1981. Hess passed away April 26, 1977, in Milwaukee. He was laid to rest at Graceland Cemetery. With The Bear Boys we've almost run the entire gamut on Hans Horina's comics for the Chicago Tribune (only one left that hasn't made an appearance yet on Stripper's Guide). 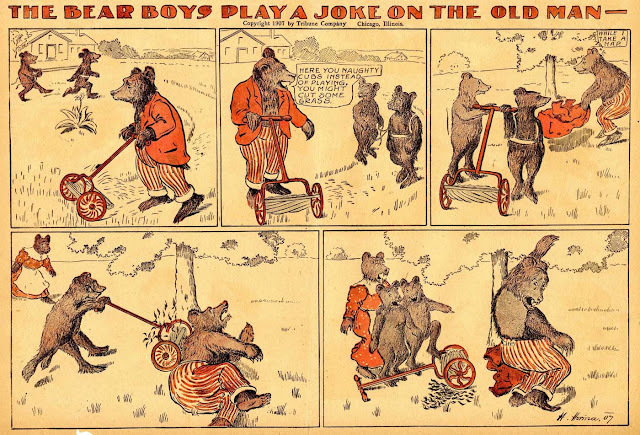 The Bear Boys is actually a rejiggering of The Rhinoceros Boys, which was a Katzenjammer Kids rip-off with the nod to originality being that instead of human kids, the little rascals are, of all things, rhinos. 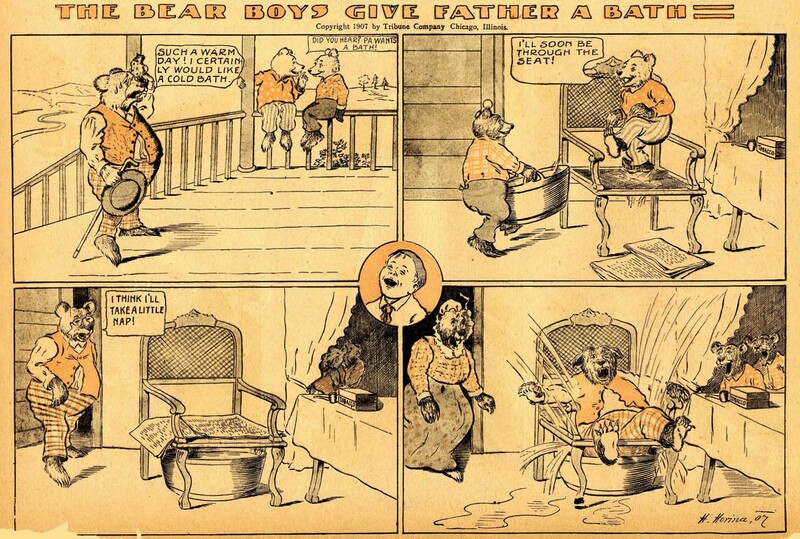 The Rhinoceros Boys ran in the Tribune Sunday section from January 27 to June 2 1907. On the next Sunday the rhinos had transmogrified into bears. Why? Blame the story about Teddy Roosevelt taking pity (of a very minor sort) on an old injured bear while on one of his game hunts. Publicity about the event led to a national bear mania, and I guess Horina figured it was about time he climbed on board. The Bear Boys ran from June 9 to August 25 1907*, so obviously his Katzie-inspired bears didn't make an impression on Tribune readers. Thanks to Cole Johnson for the scans. * the end date could be off by a little -- the Chicago Tribune archive I indexed to get these dates had been cherry-picked for Lyonel Feininger comics prior to it being microfilmed, so some pages that may have had this strip have been lost. It looks like that August 25, 1907 date is accurate. The Tribute archives shows a new Hans Horina comic, with an elephant on the receiving end of slapstick provided by a lion. That ran through November 3, and was replaced by another Hans Horina comic about "Professor Edison Dodger", who was the designated slapstick target for that run. Jerome Emil “Rome” Siemon was born on August 8, 1900, in Rock Island, Illinois. His first name, Jerome, was recorded in the 1910 U.S. Federal Census and his Social Security application. The middle name was on his World War I and II draft cards. According to Illinois marriage records at Ancestry.com, his parents were Peter Siemon and Emma Johnson who married on September 25, 1899 in Rock Island County, Illinois. The 1900 census was enumerated in June. Siemon’s mother was living with her mother, Anna, siblings, niece and nephew in Rock Island at 613 Ninth Street. The whereabouts of Siemon’s father is not known. The 1910 census said Siemon and his mother, who was divorced and a nurse, were living with his maternal grandmother and aunt in Rock Island at 613 9th Street. The Rock Island Argus, January 20, 1914, published the names of the Hawthorne School eighth grade graduates. “Romie Siemon” was one of 35 graduates. The name Romie was used in city directories and in later censuses. The 1916 Rock Island city directory said Siemon was a clerk residing at 613 9th Street. The 1916 Davenport, Iowa city directory listed Siemon as Rock Island resident working as a clerk at R. G. Dun & Company. The 1917 Rock Island city directory said Siemon was working at a Rock Island manufacturing company. Siemon signed his World War I draft card on September 12, 1918. His home address was 1125 3rd Avenue in Moline, Illinois. He was a clerk at the Rock Island Plow Company. He was described as medium height and build with blue eyes and brown hair. The 1919 Moline directory said he was a clerk at the “Peo Power Company” in Rock Island. His address was 1125 3rd Avenue, and in parentheses was the name of his wife, Olga. Siemon’s address was the same in the 1920 census. He and his mother were counted together but not his wife whose status is unknown. Siemon was employed at a power company. Siemon’s address in the 1920 directory was 1809 3rd Avenue. On July 24, 1923, Siemon married Beatrice Vogel in Clinton, Iowa as recorded in the Iowa marriage index at Ancestry.com. According to the 1930 census, the couple resided in Moline at 1602 3rd Avenue. Siemon was a hotel manager. In a few years Siemon moved to the West Coast. Siemon, his wife, two sons and mother were at 6336 1/2 Homewood Avenue in Los Angeles, California. Siemon was a hotel manager and his wife a hotel maid. The census said Siemon was in Los Angeles in 1935 and his highest level of education was the eighth grade. Siemon’s World War II draft card named his employer, the St. Paul Hotel. He was five feet eleven inches, 180 pounds with blue eyes and brown hair. Information about Siemon’s art training has not been found. 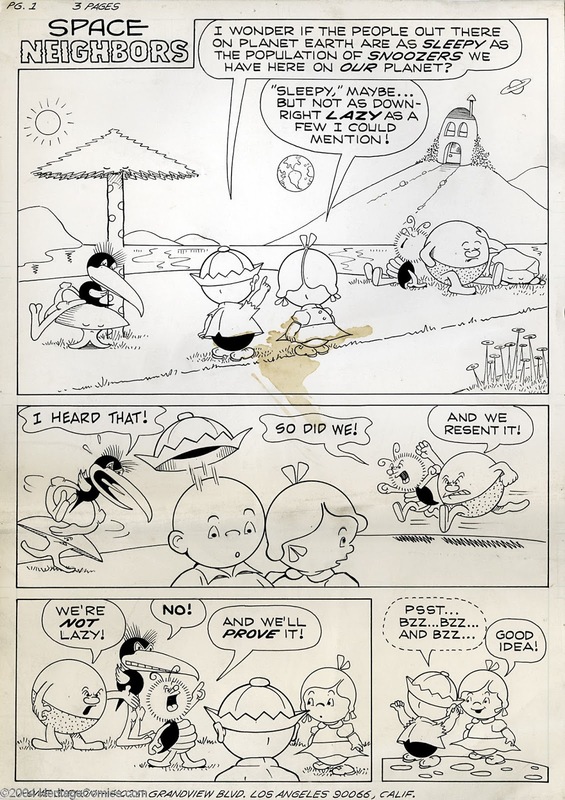 American Newspaper Comics (2012) said Siemon drew the panel Collection Day Chuckles from 1948 into the 1950s for the Newspaper Boys of America. Siemon also produced Little Moonfolks in 1952 for the Associated Press. The Catalog of Copyright Entries, Third Series, Volume 3, Parts 7–11 A, Number 1, Works of Art, etc., January–June 1949 had this entry: “Siemon, Rome © The little folks of Circleville. [Caricatures] Print. © 4Feb49; K19004.” Heritage Auctions sold two pages of Siemon’s unpublished comic book story for Harvey Comics. The Dispatch (Moline, Illinois), December 4, 1952, explained Siemon’s involvement in their Christmas fund raising. Rome Siemon, the fairly widely known cartoonist who got his start in his working life pounding a piano in a nickel movie in Rock Island (he was just a kid and his family was poor) apparently has been doing some Christmas shopping and thinking of poor orphan youngsters. For several years Mr. Siemon, who lives in Hollywood, Calif., has been, taking time out from a busy working career to draw cartoons to help the Moline Good Fellow Christmas fund sponsored by the Dispatch. Rome knows what it is to be up against it at one stage in his career that was in Moline he found the piano playing picking so poor that he thought he was lucky to get a part-time job as a LeClaire hotel elevator operator. If Siemon’s cartoon plea appeals to you, send a contribution to this Christmas program to bring some cheer to needy children and widows to Good Fellow Fund, Moline Dispatch, or drop in with buck or two (or more) and some one at the Dispatch office will be glad to take it. Siemon passed away October 6, 1969, in Los Angeles according to the California death index. He was laid to rest at Forest Lawn Memorial Park. If you delivered newspapers as a kid, you certainly remember that the worst part of the job was to collect the subscription money. There were always people on your route who never paid their bills on time, or gave you a run-around. Any fantasies we kids had of being invited in by beautiful housewives wearing negligees on collection day were quickly dispelled. Hairy guys in undershirts with ugly dispositions seemed to be behind every door. A group of newspaper publishers got together in the 1920s or early 1930s and formed an organization called the Newspaper Boys of America. The purpose of the organization was to teach kids how to be effective in their jobs -- one of the key points being how to get those deadbeat subscribers to pay up. In 1948 the organization put together a series of panel cartoons titled Collection Day Chuckles, and offered them free to newspapers. The idea, obviously, was to remind newspaper readers to pay their newsboys. Although the gags were pretty uniformly bland and unfunny, the point was being made. The cartoons were to be run on any frequently the newspaper wanted, and they were supplied in batches. It's probably impossible to tell just how many of these cartoons were produced. Though some are numbered and those are generally in the 500s, I see enough re-run cartoons showing up in papers that my guess would be way lower, certainly no more than a few hundred. I've encountered Collection Day Chuckles appearing as late as the early 1960s, but I imagine they were only actually being produced for a few years, and the material then sat for years in slush piles. 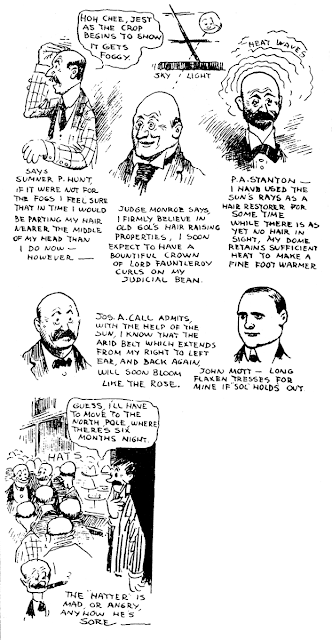 Most of the cartoons were drawn by Rome Siemon, who will be profiled tomorrow, but a subset (mostly the numbered ones) were by a different cartoonist (or catoonists) who did not sign them. "Everybody in wig-wam have heap fun with the comics--just like white family." Gee, the well meaning casual racism in this panel cartoon is chilling for so many reasons. What a concept, Native Americans enjoy the comics just like the immigrants do! Woo-woo-woo-woo everybody!